WaterStone Foundation is a community of concerned parents, community leaders, medical and clinical advisors, donors, and supporters inspired by a vision of health lives free of eating disorders. Our goal is to provide much needed funding to support the full continuum of eating disorders including prevention, treatment and supporting post treatment. We invest in research, hospital programs and financial assistance for patients needing urgent care who fall through the cracks in our public healthcare system. Increase treatment capacity across the country so that more patients can receive treatment sooner. Provide access to care with financial support where the public system is faced with challenges. De-stigmatize while increasing awareness and advocating for greater support. Accelerate research in prevention and cure. The beginnings of WaterStone Foundation are rooted in the experience of two families. They were motivated to take action and drive meaningful change as a result of the challenges and difficulties they faced in finding help for their daughters who were diagnosed with an eating disorder. Early on the families realized that publicly funded treatment options in Canada incorporating family therapy programs were scarce, underfunded and unable to meet demand. Their compelling need to find innovative, fully integrated, tailored, sustainable support their daughters led to the creation of WaterStone Clinic. The Clinic provided a unique, customized healing experience led by highly trained specialists in eating disorder treatment and a multidisciplinary team of clinicians. Clinic founders were motivated to help other families facing the devastating impact and potentially dire consequences of eating disorders. They created a foundation dedicated to the cause, understanding that specialized treatment without the assistance of public funding can be costly and treatment may be ongoing for years. Recovery from an eating disorder can’t happen in isolation. People with eating disorders and their families and caregivers need a caring community of support that provides the right treatment and support in the long-term but also understanding, hope and compassion. WaterStone Foundation exists to make sure others are not alone in this process. WaterStone Foundation – why we need to tell the story. June 2 World Eating Disorder Day. Many members have a personal reason to be involved in the Foundation. All of them bring them passion, determination and experience to ensure the WaterStone Foundation fulfils its mandate. Ms Duffy is the Co-Founder and Board Chair of the WaterStone Foundation. Kim’s passion and determination to help families evolved from her own family’s lengthy and complex journey. Kim received her Bachelor’s of Arts degree from Purdue University. Her career in the Healthcare Industry began at AT/T in Chicago where she was responsible for Employee Health Promotion. After a move to Celtic Life Insurance as Assistant V. P., she marketed individual health insurance plans for college students. In 1990 she moved to the UK where she joined BUPA (British United Healthcare ) marketing health insurance to individuals and families. After 12 years of living abroad, the expanded family returned home to Toronto. Kim immersed herself in her 4 children’s activities, volunteering on numerous school and community committees including the Women’s Auxiliary at the Hospital for Sick Children. In 2013, the Duffy family co-founded WaterStone Clinic., a highly specialized outpatient clinic focused in the treatment of eating disorders. In 2015, WaterStone Clinic was acquired by the Edgewood Health Network to further expand capacity and needed in-patient beds. Kim has been active in the eating disorder community since 2011 when she initially assisted with the launch of the National Eating Disorder Information Centre’s (NEDIC) first fundraising and awareness event. Kim completed Rothmans School of Management NFP Governance Essentials Course in 2015. She is a member of the Eating Disorder Association of Canada and the Academy of Eating Disorders. Ms Peters has previous experience as a Senior Legal Counsel for the Ontario Securities Commission where she provided the senior legal advice to the commission and staff regarding corporate finance, mergers and acquisitions and other matters. She has been a lawyer with the Law Society of Upper Canada since 1987 and is a law graduate of the University of Toronto. Ms Peters also practised corporate, commercial and securities law at Fraser and Beatty. 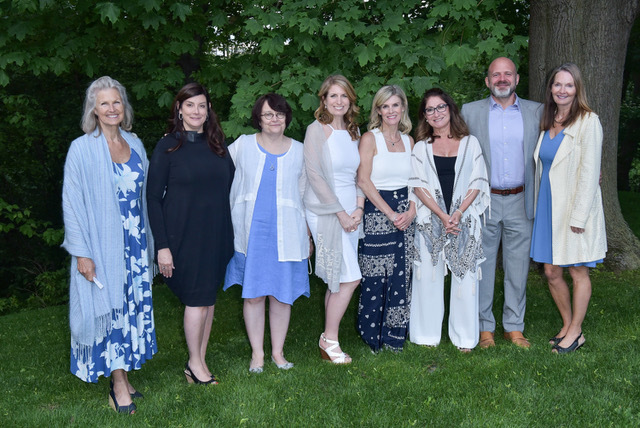 More recently Joanne co-chaired Empty Bowls helping raise almost $100,000 at each event for Home Suite Hope and sits on the Board of the Oakville Community Foundation. At WaterStone Foundation, Joanne is Secretary, Chair of the Financial Aid Committee and a member of the Fundraising and Marketing Committee. Ms Hall-Holland spent many years as in Equestrian sport, initially as a member of the Canadian Equestrian Jumping Team and later as a trainer and breeder of Olympic and Pan American team horses. Kelly also worked as a television commentator for CBC and AMI from 1975-2013 and Treasurer of Region of York, overseeing a $250 million budget. More recently Kelly has been very involved in the eating disorder community as Executive Director of the Eating Disorders Foundation of Canada and with various other organizations and initiatives. Kelly is a graduate of University of Western Ontario – Honours Bachelor of Science, Physiology, 1973, the Institute of Chartered Accountants of Ontario – Chartered Accountant, 1979 and the College of Massage Therapists of Ontario – Registered Massage Therapist, 2001. Kelly is currently Chair of the WaterStone Foundation Finance Committee. Ms Simpson is the Vice-Chair of the Fundraising Committee and a member of the Financial Aid Committee for WaterStone Foundation. She earned her Bachelor of Science (Specialist in Zoology) and Bachelor of Education at University of Toronto. She also completed an additional Honour Specialist in Biology and in Guidance. Donna taught Biology and Science full time at Father Henry Carr Secondary School before starting her own private tutoring business for students of all ages. She currently substitute teaches Science and Math at Upper Canada College. Prior to WaterStone, she was involved with fundraising and advancement at Kingsway College School (KCS) and Upper Canada College (UCC), most notably chairing the BBC committee at UCC. She has also co-chaired several Gala fund-raising events at KCS and Beaver Valley Ski Club. Her intuitive insight and solid ethical compass make her a valued addition to the WaterStone team. Ms Gernon is the founder and president of Profit Business Consulting Inc. where she advises companies on strategic planning in sales, marketing, partner and talent optimization. She earned a Bachelor of Science in Physics from the University of Waterloo. Her experience is based on 17 years as a key executive at Microsoft, followed by several years of consulting for a wide-range of companies, with a proven track record. Lora advises various companies on strategy and growth. At WaterStone Foundation, Lora is a member of the Financial Aid Committee and Vice Chair of the Governance Committee. Ms Jasper recently retired as Clinical Mental Health Specialist in the Eating Disorders Program at Southlake Regional Health Centre in Newmarket, Ontario and is an Assistant Professor in the Department of Psychiatry at the University of Toronto. She is a co-author with Dr Ahmed Boachie of A Parent’s Guide to Defeating Eating Disorders: Spotting the Stealth Bomber and Other Symbolic Approaches and co-editor with Catrina Brown of Consuming Passions: Feminist Approaches to Weight Preoccupation and Eating Disorders. Ms Jasper has worked in the field of eating disorders for over twenty years, first in private practice with young adults and adults, and since then with children and adolescents in hospital settings. Karin is also Vice Chair of the WaterStone Foundation Financial Aid Committee. Michelle Busic joins the Board of WaterStone Foundation with experience and enthusiasm from being involved in various charities over the years specializing in fundraising. Michelle formed and co-chaired the inaugural fundraising committee at High Park Montessori School. She has also been a committee fundraising member for Appleby College’s Annual Gala and for Special Olympics Sports Celebrity Festival. Over the past few years, Michelle has been a passionate supporter of WaterStone Foundation and its vision. She hosted the WaterStone Foundation Garden Party for two consecutive years and looks forward to assisting in the creation of other fundraising opportunities to drive awareness; ongoing and future donations. Michelle previous career was in the television industry with CTV news. She then developed a career in the fitness and wellness area so she could spend time with her children and family. She is a certified Pilates instructor and is trained in RTS. She holds a Bachelor of Arts from York University. Ms Palmaro has spent over 20 years in various leadership positions in both the corporate and charitable sectors. After 14 years with Microsoft Canada, Sandra joined SickKids Foundation as Executive Vice President. Most recently Sandra spent 6 years as CEO, Canadian Breast Cancer Foundation, Ontario Region. Previous to the Executive Director role at Waterstone Foundation, Sandra served on the Waterstone Foundation Board of Directors as Vice Chair and Chair of the Governance Committee. Sandra has also previously served on the Board of Boys and Girls Clubs of Canada for 8 years, 3 years as Board Chair and on the Governing Council, Health Charities Coalition of Canada for 2 years. Sandra recently completed the Directors Education Program at the University of Toronto Rotman School Institute of Corporate Directors, receiving the ICD.D designation. Dr Marcus is a Clinical Psychologist and Director of Fairmarc Psychology Centre, a private practice in Toronto. She is also an Adjunct Faculty member in the Department of Psychology at York University and provides various workplace mental health workshops/ training. She has extensive experience in psychological assessment and treatment of individuals with diverse clinical concerns including eating disorders, mood and anxiety disorders, personality disorders, trauma, self-harm behaviour, and interpersonal and adjustment related difficulties. She provides individual and group therapy, as well as comprehensive psychological assessments including cognitive and personality assessments. While she has experience in a number of evidence-based treatments, her primary approach includes Cognitive-Behavioural Therapy ( CBT), Dialectical-Behavioural Therapy (DBT) and mindfulness-based approaches. Dr Marcus’s professional experience includes psychology positions in outpatient, inpatient, day hospital, community, and private practice settings. She received her PhD in Clinical Psychology from York University. Working in the financial industry and RBC for over a decade Andre has proven his ability to understand the personal needs of an individual to assist in achieving their goals as both a leader and a Financial Advisor. During his time Andre has also expanded his expertise volunteering for Juvenile Diabetes Research Fund, United Way, Free the Children, and Junior Achievement. He graduated from the University of Waterloo with a Bachelor of Arts, specializing in Communications and Political Science. Through his experience with a genuine passion to support his community and those in need make him a great asset to the WaterStone Foundation’s Financial Aid Committee. WaterStone is a registered Canadian Charity with a documented track record. Charitable Registration No. 85399 7898 RR0001. We are committed to optimizing the generous contributions of our donors and putting them to best use and to sustainable, transparent governance. To treat donors and prospective donors with respect. To guarantee that a donor’s gift is applied towards activities for which it was given. To disclose the charity’s name and the purpose for which funds are requested while seeking donations. To never mislead donors or prospective donors with foundation claims. To grant donors the right to remain anonymous. To provide all published financial statements upon request. To demonstrate the utmost transparency and accountability through accurate and accessible disclosure of information. To establish whether an individual soliciting contribution is a volunteer, an employee or a contracted third party. To respond promptly to a complaint by a donor or prospective donor. You can review all Audited Financial Statements here.